When Apple first unveiled the latest iteration of its Mac OSX operating system, codenamed ‘Leopard’, the marketing slogan read: “Redmond, start your photocopiers“. The suggestion being that Microsoft would, shortly thereafter, attempt to replicate all of Apple’s innovations. In 2008, the same charge might also apply to any number of cellphone makers as they scramble to respond to the iconic iPhone. This week it was Nokia’s turn, reports InfoWorld. During a presentation at the Evans Data Developer Relations Conference in Redwood City, California, Nokia’s Tom Libretto showed a slide that portrayed a new device similar in looks to Apple’s iPhone, codenamed “Tube”. Featuring a touchscreen and graphic-heavy interface, Libretto said the “Tube” will support Java – a feature lacking on the iPhone – and will also be capable of uploading photos to the Web. Other details such as additional features or a launch date weren’t revealed. Based on the devices codename, The Register speculates that the “Tube” will be pitched very much as a mobile video device and could include a digital television receiver. It’s also likely that the “Tube” will run the next generation version of the Symbian-based mobile operating system, S60, which Nokia has already said will include touchscreen support with the addition of “tactile feedback”. 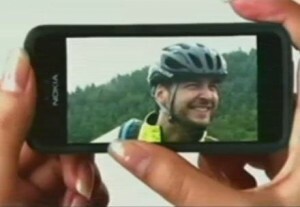 Of course, Nokia isn’t the only company to be readying an iPhone response. Last week Samsung announced its iPhone-like “Instinct” handset in conjunction with Sprint, and LG already has its own iPhone-esque offering. Perhaps more significantly, the Google-led Android mobile OS is shaping up to have a very iPhone looking User Interface, and in terms of rich Internet applications and a fully-fledged Web browser, stands a good chance of giving Apple’s own mobile OS a genuine run for its money. All of which isn’t a bad thing. Looking back in a few years we’ll likely debate to what degree Apple’s entrance into the mobile arena has wrested control away from the carriers. But what there is little doubt: the iPhone is already awakening all of its competitors from a usability coma.